Members of Parliament (MPs) are elected by the people and are responsible for making the laws that govern our country. The stamp here shows a parliamentary session in progress at the Old Parliament building (now the Arts House). 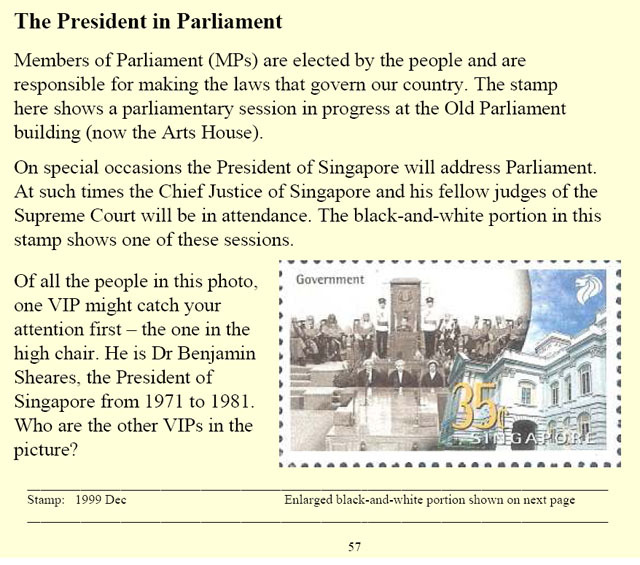 On special occasions the President of Singapore will address Parliament. At such times the Chief Justice of Singapore and his fellow judges of the Supreme Court will be in attendance. The black-and-white portion in this stamp shows one of these sessions. Of all the people in this photo, one VIP might catch your attention first – the one in the high chair. He is Dr Benjamin Sheares, the President of Singapore from 1971 to 1981. Who are the other VIPs in the picture?